October 25th, 2017 – Last Monday, October 23rd, a price peak was observed in the PVPC (voluntary price for the small consumer), the default tariff regulated by the government that fixes the electricity price for nearly half of the Spanish households. The electricity price between 6:00 PM and 10:00 PM averaged 173.60 €/MWh, and reached a maximum of 182.54 €/MWh between 7:00 PM and 8:00 PM. These prices are higher than those registered on January 25th this year in the midst of the cold snap that sent the energy prices through the roof. Breakdown of the default tariff PVPC. 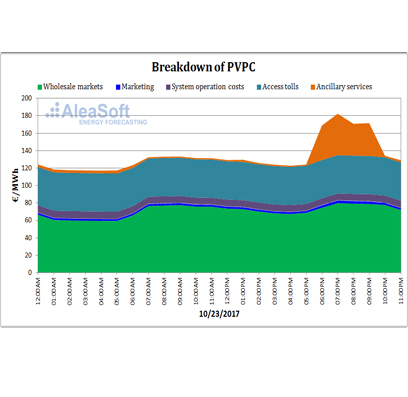 The high PVPC prices in January this year were due to the rise of the prices in the wholesale day-ahead and intradaily electricity markets, which accounts for approximately half of the total of the PVPC. The case of last Monday was of a different nature: the prices in the day-ahead market are far from reaching the same values of January, although they are in a clear upward trend. It was the price of one of the ancillary services, the upwards power reserve market, the one that suffered a price peak not seen in that market since 2012. 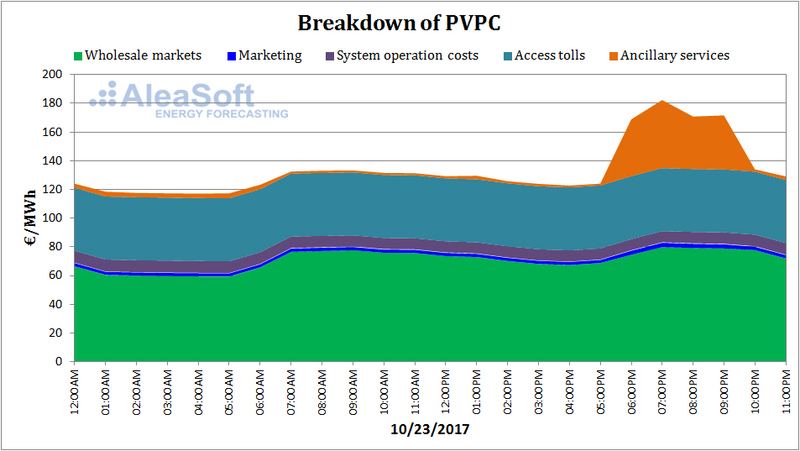 That price peak raised the total PVPC price. All signs point to it being an isolated event, as it did not occur again neither the following hours nor the following days. Meanwhile, the price of the MIBEL day-ahead wholesale market is undergoing a clear upward trend that is raising fears that the high prices of last winter could happen again. There are several causes behind this price rise. On the one hand there is the inertia of a very-low wind and extremely dry year, with historical minimum values of the level of the reservoirs and the hydroelectric production. Both the wind energy and the hydroelectric production push down the electricity prices. In situations of low production of these technologies, the gap to match the electricity demand must be filled with coal- and gas-fired plants that have higher production costs. And on the other hand there are the fears of possible problems with the French nuclear plants that, as in this time last year, are undergoing safety checks and that, in the worst-case scenario, if they are kept shutdown, will left the country with a large power unavailability that will force to import electricity from its neighbors, including the Iberian Peninsula, and will push the energy prices up throughout Europe. 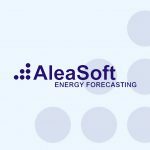 Concerned that a French nuclear flu could happen again, the market agents are covering their position in the futures markets that are experiencing an increase in the traded volume and consequently in the prices.